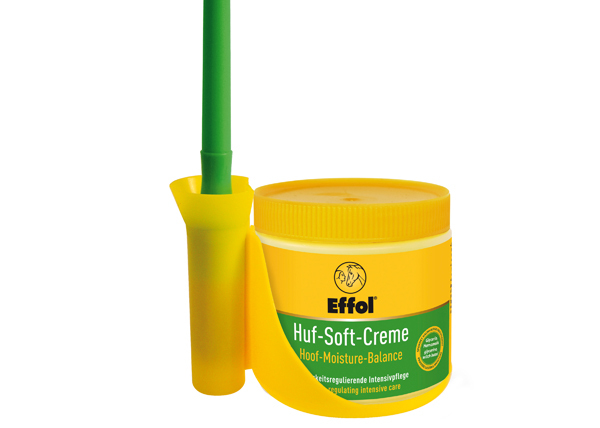 The specially developed, caring components of glycerine and hamamelis (witch hazel) of the Effol hoof ointment Hoof-Soft provide long-lasting moisture and restore the balance in the hoof. Due to the protective layer created by the use of the moisturizer, the hoof is optimally protected against external influences, even when the horses walk on a wet meadow or go into the aqua trainer. To optimally protect the hoof against extreme moisture, the Effol hoof ointment can best be applied to the sole. Thanks to the unique Effol Pinsel-Fix the brush can easily be attached to the can.